Banknotes production is the main activity of the company as the name indicates (Sudan currency printing press). 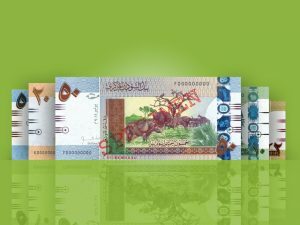 The company is the unique authorized of printing banknotes in Sudan. It supplies all the needs of the central banks, in a high technical and secured quality, Also the company serves as a consultant to central bank by acquainting the latter with the latest innovations in currency printing. Its activity in banknotes printing began within the framework of the government to build basic supports to fulfill the national sovereignty, and planting supports of settlement and self-dependence. The real production began in August1994, which was considered a real achievement. The company cares for the qualification of human resources in the different jobs and specifications. To update with the global development, the company in a short time achieved an administrative development according to its strategy and philosophy, gaining confidence and distinguished place among colleges in the world of currency printing, that it hosted the conference of the African union of printers of currency and secured documents in 2004, and was qualified for the certificate of ISO (9001-2015) In 2004, which was renewed four times), and now looking forward to obtain ISO (9001-14001-18001-14298) . A metal thread in the back side of note in silver color which looked continuous and dark with light engraved writing, Plus the number of the denomination in both English and Arabic, when seen through aback light or rose to the sun light. Printed on both edges of the note, on the upper right edge, and the lowest left edge, in black color, with a verifying letter before the serial number. The watermark is done while manufacturing the paper, seen when the paper is raised against light, or checked with light under it, appeared in the white space , so when counterfeiters try to print a watermark it cannot appear with in light. An image that appear partially on the front side, and partially on the back side when seen with in aback light or raised to sun light, appeared the complete image with the full correspondence in printing between both sides of the paper. letters , when moving the paper under direct light it appeared in rainbow colors according to the sight angle, and denomination number changes between English and Arabic . The shape that locate on the left of intaglio printed image, which distinguished each denomination individually, when you look to the paper from an angle of (45ْ ) while moving it, but we do not notice that if we look vertically to do it. Special engraved symbols recently innovated, were printed on the note so that blinds can recognize the denomination by touching it with their nails and fingers. These symbols are horizontal lines in three groups, plus a circle with a spot inside it, located on the front of the lowest group. Number of lines differ between denominations. There are features that appear when looking to the note under ultra sound rays, where appear glittering fibers distributed in the bottom of the note on both sides, and in different colors according to the denominations value. Also appeared a multi color stripe under the holographic stripe. In the front side of the note, there are the lithographic printing lines, It differs according to the number and the color of the denomination. Done by simultan machines, which print both sides of paper simultaneously, three colors on each side at least, in recent generations of machines, more than four colors can be printed on each side. Done by intaglio machines, where the ink is transferred from a deep surface directly to the paper under a high pressure. It was considered an important securing element, because the places covered with this printing on the note have a hard raised surface. The note consists of a ten digit number, two of them are letters. The number is printed on both upper and lower edges in black color on the right and left. Sudan Currency Printing Press emerged within eight African press in currency printing. It works according to the international descriptions of quality (ISO 18001-14001-9001-14298). The company imported the latest modern machines from the international manufacturing companies in Europe (KBA).Also imported the machines of banknote processing system (BPS) that used in automatic sorting, and finishing. The company satisfies all the needs of central bank of Sudan for printed banknotes.